Oncolytics Biotech, Inc. (NASDAQ:ONCY) This technical chart above shows a possible rounding bottom formation with a potential rally back to resistance at $2.40 as the next swing for the stock. A move above the neckiline is required to trigger an upside breakout and another run. Stock price has been moving sideways in short term to build up momentum and the latest price rebound on strong volume, is another good indication that the stock is likely to test the previous high at 2.70 if the neckline of the rounding bottom at 1.92 is penetrated. Stay tuned !! 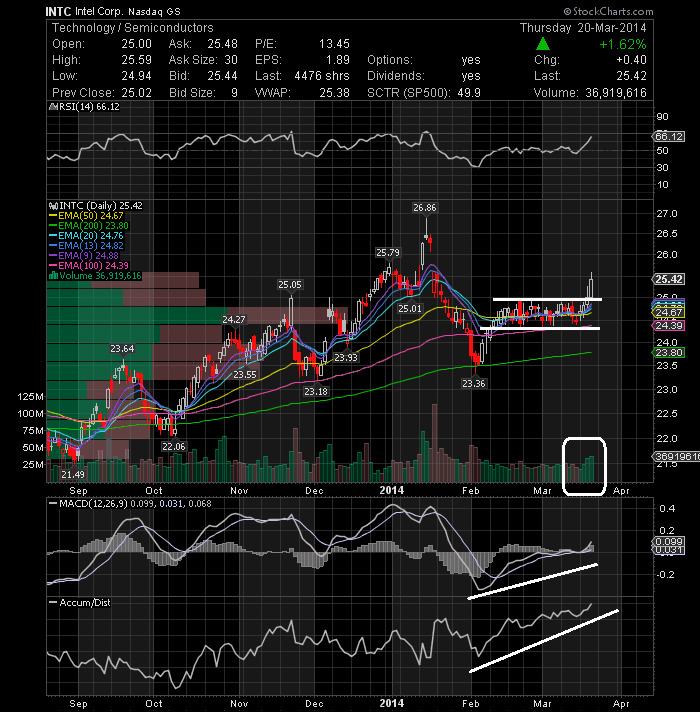 Intel Corporation (NASDAQ:INTC) finally broke out of the consolidation range that I've discussed recently. 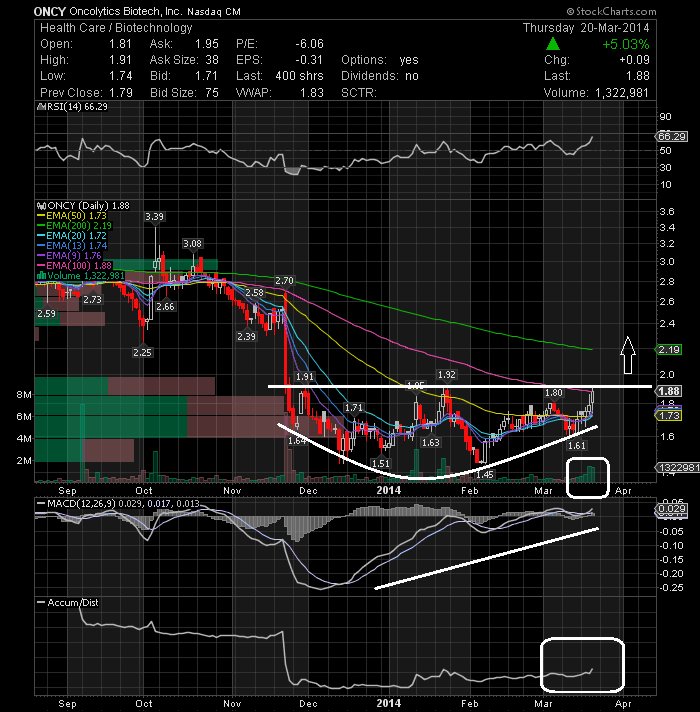 We can see in the chart above that the breakout was clean on strong volume, indicating that more upside is possible in this stock. The price can move up to $25.79-$26.21 in the short-term. 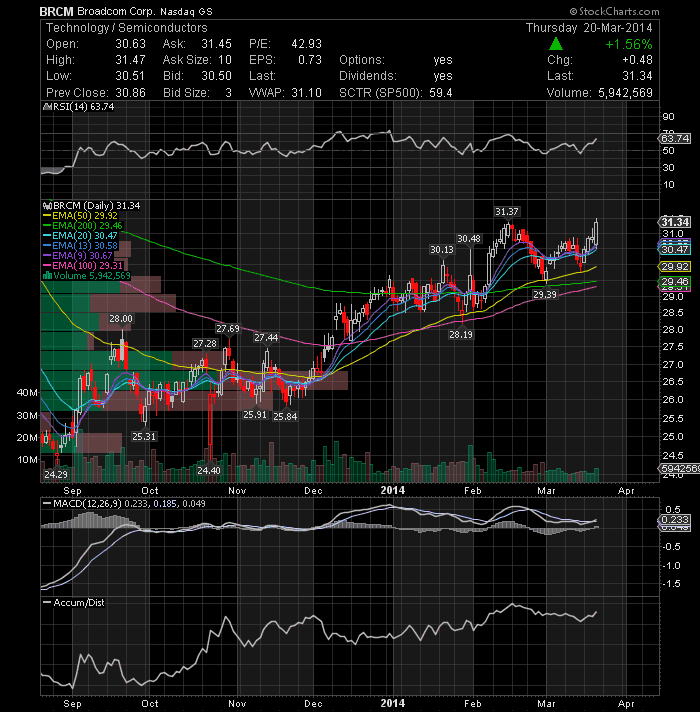 Broadcom Corporation (NASDAQ:BRCM) gained nicely today and made a new 6 month high at $31.47. The technical daily chart above shows the stock is on a bull market as it is trading above both 50-day and 200-day exp moving average and the 50-day exp moving average is on top of 200-day exp moving average heading upwards. Other indicator, such as MACD is above 0 showing positive momentum, while RSI also shows buy signal. Looks good for higher prices. Lattice Semiconductor (NASDAQ:LSCC) is still trading around $8 which has been a strong resistance over the past several days. I plan to buy the stock if it can break this key resistance level. The trend is still up. 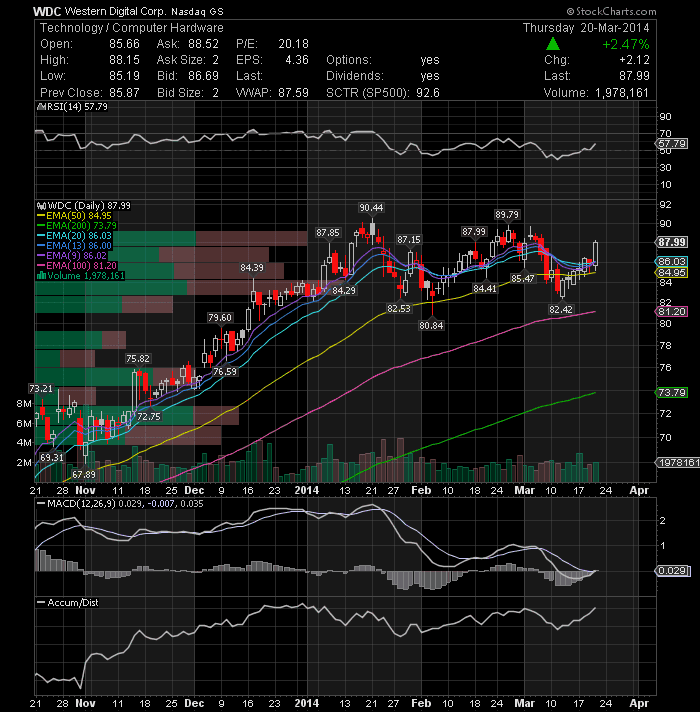 Western Digital Corp (NASDAQ:WDC) showed some strength today. The stock closed nicely above the major short-term EMA levels with solid volume. At this level, we should see the stock retest the next pivot point located at $89.79 followed by $90.44. The support level is adjusted to $85.18. 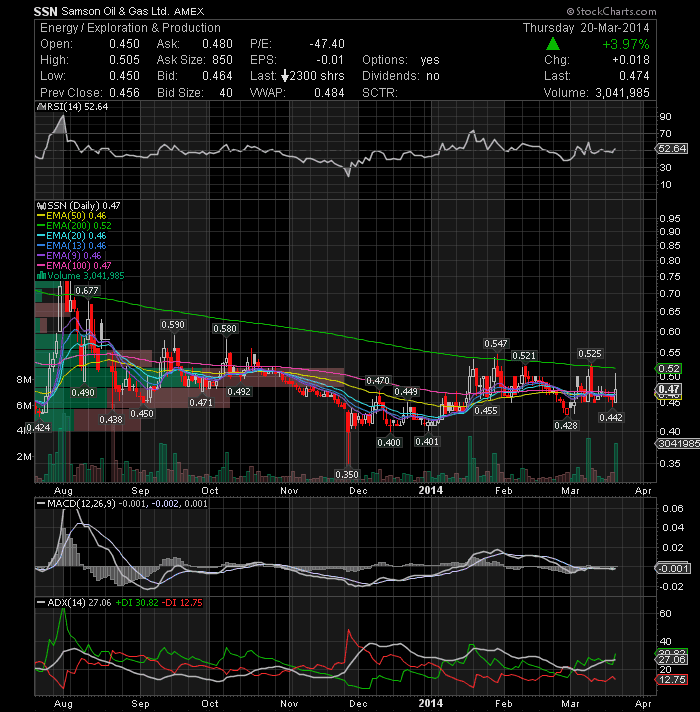 I have Samson Oil & Gas Limited (NYSEMKT:SSN) on my watchlist. It may be ready to break out of this base. 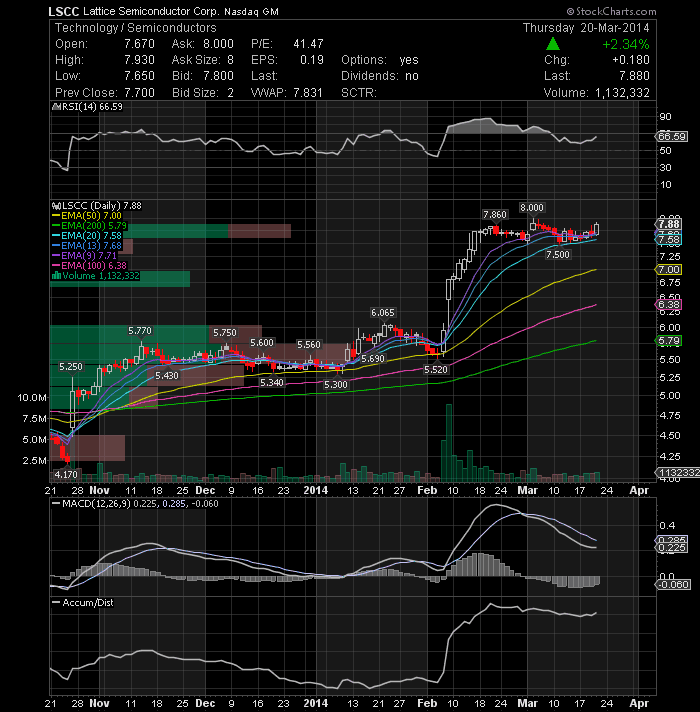 Bullish MACD cross on daily. Potential swing long above 52c (200EMA).